To put it simply, a custom meta box provides you a funnel to add more custom information to your posts, based on the absolute specifics around it. While Wordpress lets you do the same with its default provisions for image, categories, tags and so on, but there are times when these defaults do not cut the ice with you. Let's say you are building a website that catalogs a wide range of vintage cars. Each post on the site is meant to be centered around a particular car. Now, you can add the image of the car, the name of the car in the title, its description and the corresponding tags. But, if you wish to include meta data about the car's model number, how are you supposed to go on with it when Wordpress does not give you any such provision? Well, this is where the custom meta boxes have a role to play. What a custom meta box typically does is that it appears as a box on the post editing screen which lets you to add custom data to a Wordpress post or page. Because it appears in the post editor, even a novice can easily make use of it to input additional information in a piece of content. Adding meta box to your Wordpress theme is mostly about making the necessary tweaks in the functions.php file. add_meta_box: It is a function that takes input some parameters in order to communicate to Wordpress about the inclusion of meta box. wdm_meta_box_callback: It is a function that prints out the HTML for the edit screen. Post: this is for metabox to appear on page screen or post you can use page if you want to use this meta box on page screen. add_action( 'add_meta_boxes', 'wdm_add_meta_box'): This is a Wordpress action hook that instructs the Wordpress setup to add the metabox. Now, we will use the function wdm_save_meta_box_data( $post_id ) for effecting the value save process. 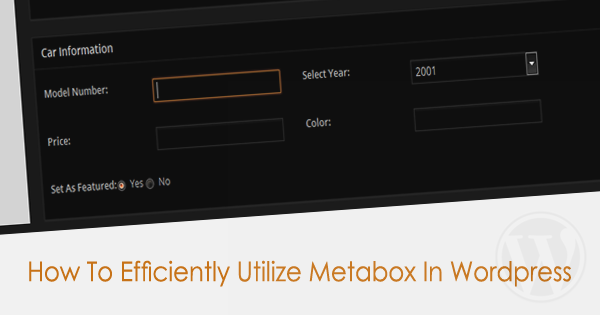 This function fetches the post id so that the metabox value is saved onto the particular post meta session in database. add_action( 'save_post', 'wdm_save_meta_box_data' ): This is an wordpress hook to tell wordpress to save post with meta value. And thus, we have created a metabox in its simplest form. It can be used for a variety of purposes, but when you need something more dynamic and rich in information, you'll need to branch out and get involved in more coding. We thus far have different textboxes for our extended meta data. These represent car colors, prices, and model numbers. How they are displayed can be figured out from the figure. // update_post_meta: This function takes three parameters – the first one is post id, the second one is metakey, and third one is meta value. What this code does is that it adds the meta-box-styles.css in your template directory. In this directory, you are free to can add your desired style that you deem suitable enough to enhance the visual appeal. We thus conclude the process of creating and utilizing metabox in Wordpress easily and efficiently. If you have any questions regarding the exercise, do let us know in the comment section below. Ben Wilson is a WordPress developer and senior editor at WordPrax. He also provides conversion services like HTML to WordPress theme and many more. If you are looking for the aforesaid services feel free to contact him.